And once again the three found themselves hunched over a dead dog, each shoveling the entrails into their mouth as fast as they could. That Dead Dog is the American Dream. And, those entrails are the memories of it. So, we also reviewed “Horns” by Joe Hill. In a change of pace, Wilk (me), did not like this book as much as the other two panelists/clowns. Ryan and Rick both thought it was an excellent book, whereas I thought it was an excellent premise trapped in a mediocre book. As usual, I was right. To the uninformed person who is reading this article, Joe Hill is the son of Stephen King. This was touched on as well, but we tried to stay away from it (and we failed, as is the style and overall theme of our show). I could not get past how the main villain kept developing criminal mastermind powers (henchman) as the story evolved. The movie Horns was not well received by anyone. It stripped a lot of base elements of the story away and replaced them with unneeded tropes that did nothing. It had the scope of the book down, but ultimately the changes it did make to the story did not enhance it. 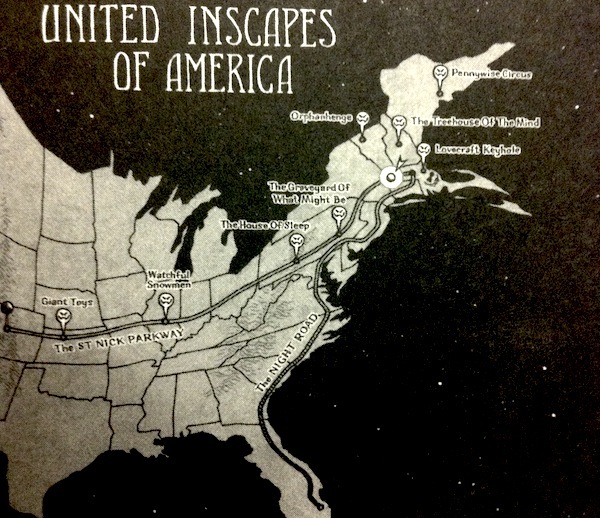 On the podcast, Rick mentioned that there was some connection between the ideas in the novel “Horns” and one of the author’s other books “NOS4A2.” A blogger posted an Inscape map from the latter book which clearly shows “The Treehouse of the Mind” as a place of reference (Rick – you were right!). Check out the map found here in this article on “NOS4A2” by Cassandra Rose at this book review website: http://bibliomantics.com. Incidentally, Wilk, went on a brief non-sequitur about watching some old interview where actor Tony Danza remarked that he doesn’t prefer to wear deodorant. We found a clip of a scintillating, April 8, 2002, interview that touched on that topic from the Daily Show with Jon Stewart. Check it out here (at about the one minute mark): http://thedailyshow.cc.com/videos/vs8woy/tony-danza. what idem are you looking for? when is your desired time?